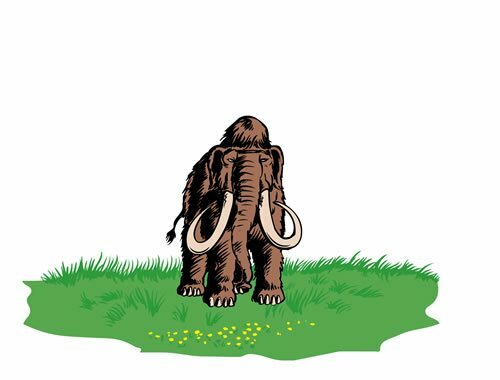 The woolly mammoth is the poster child for the Ice Age just as the polar bear is the poster child for global warming. A woolly mammoth is likely a member of the elephant kind with long hair up to 1 meter long, a hump on its head and top of its back, and a sloping lower back.1 It was once thought the woolly mammoths did not have oil glands in their skin, disastrous in a cold climate, but better samples show they did have them.2 The woolly mammoth lived all across the mid and high latitudes of the Northern Hemisphere during the Ice Age. Both the Ice Age and the many millions3 of woolly mammoths buried in Siberian permafrost, permanently frozen sediment, have been major uniformitarian mysteries for about 200 years4 despite numerous theories. 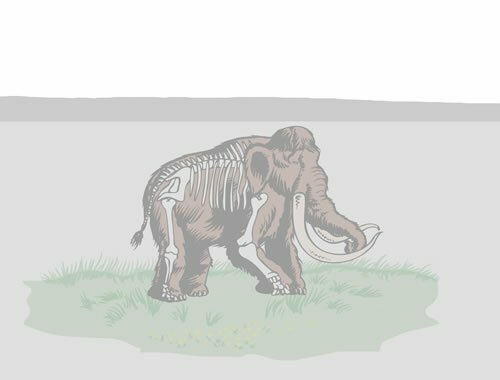 Another type of mammoth, the Columbian mammoth, lived farther south in the United States and Central America. 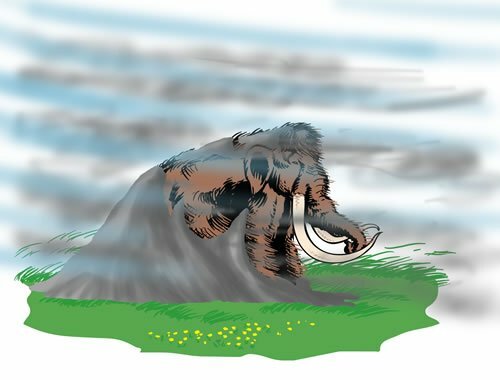 Woolly mammoths lived alongside woolly rhinoceroses, cave bears, cave lions, saber-tooth tigers, ground sloths, dire wolves, the “Irish elk,” various types of horses, several types of bison, and many others. The Northern Hemisphere, even Siberia during the Ice Age, was considered to be like the Serengeti of Africa. Dale Guthrie of the University of Alaska in Fairbanks has called it the “mammoth steppe,” characterized by a wet spring and a dry summer with tall grass. Except for the carnivores, the Ice Age animals were grazers. At the end of the Ice Age, many of the animals over 100 pounds (45 kg) as well as many carrion birds went extinct or disappeared from entire continents. There was a 70% loss in North America, 40% in Eurasia, 80% in South America, 90% in Australia, and only 20% in Africa. According to the uniformitarian paradigm, most of these animals were extinct by the end of the “last” ice age. Today, secular scientists think that within the past 2.6 million years of the Pleistocene there were about 50 ice ages of various severities.5 Between these ice ages or “glacials” were “interglacials,” warm periods after the ice melted. According to them, we are living in an interglacial period called the Holocene. Uniformitarian scientists have argued over the cause of the mass extinction. Three possibilities have been suggested: 1) climate change, the “overchill hypothesis”; 2) man killed them in a great slaughter, the “overkill hypothesis”; or 3) man’s diseases killed them off, the “overill hypothesis.” Man is considered as a possible cause because mass extinction happened only near and after the last ice age, when man supposedly came on the scene. There is very little evidence for man’s role. Only a small number of human/mammal interactions have been found, such as spear points found in mammoth bones. To make matters worse for the uniformitarian paradigm, the mass extinctions happened when conditions were improving. The ice sheets were melting, the climate was warming, and more territory was opening up. Mainstream science has always believed the extinctions took place during cold spells with the last die off occurring during the short cold spell of the Younger Dryas, except for Australia, that ended about 10,000 years ago. But recently several researchers claim the extinctions happened during warm periods.6 They now say most of the animals died well after the worst cold spell, called the “Last Glacial Maximum” or LGM, which is dated at 19,000 to 23,000 years ago and before the Younger Dryas. SCIENTISTS RECENTLY DISCOVERED THE EXISTENCE OF WARM AND COLD PERIODS DURING THE “LAST” GLACIAL PERIOD. Scientists recently discovered the existence of warm and cold periods during the “last” glacial period. These warm and cold periods are of short duration, supposedly on the order of a hundred to several thousand years long with the Younger Dryas being the last (fig. 1). The cold periods are called stadials and the warm periods interstadials. The evidence for these stadials and interstadials was found in Greenland ice cores and is thought to represent “abrupt climate changes,” a new paradigm in ice age research. The temperature change is supposed to be up to 20°C over much of the Northern Hemisphere and have occurred within just a few years to a few decades.7 It is interesting that after this discovery, scientists found stadials and interstadials in other records of the late Pleistocene, whereas they were rare before.8 The researchers fit the extinctions into these abrupt climate changes, mostly into the warm phases.9 But all these extinction dates depend upon a complete sample of Pleistocene fossils and very precise dates. Although what exactly would be an accurate representation of the samples from that layer would be difficult to assess, we know at least that the assumptions on which the dates are based are flawed, even if they seem precise. Figure 1. 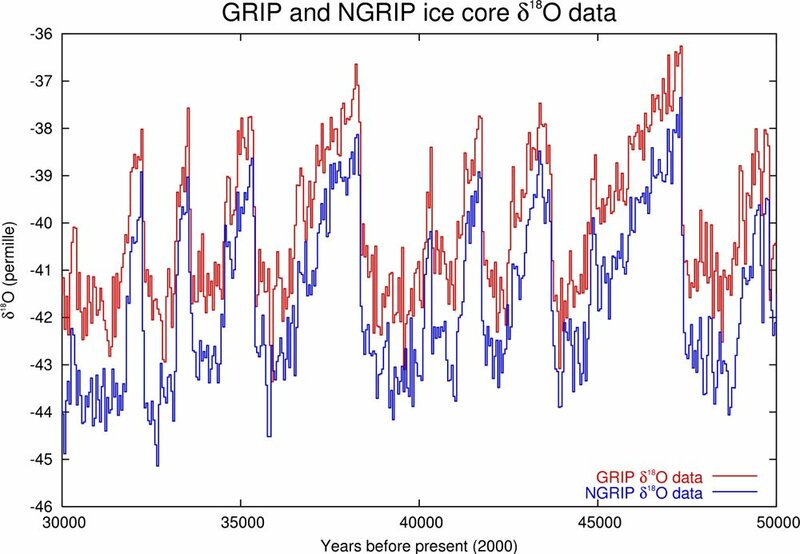 Abrupt climate changes in the GRIP and NGRIP ice cores from Greenland inferred by changes oxygen isotope ratios from 50,000 to 30,000 years ago within the uniformitarian timescale (Wikipedia). The oxygen isotope ratio is believed to be mostly proportional to temperature with more negative values warmer. Image courtesy of Wikipedia. 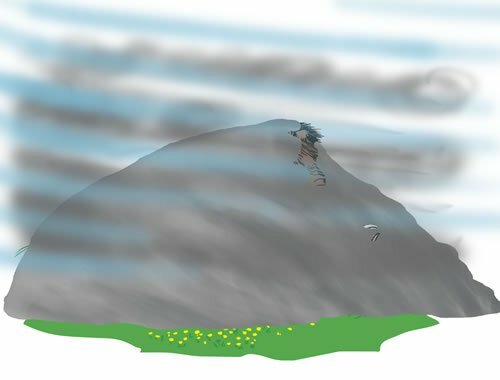 Is Extinction During Warmer Conditions Reasonable? Within the uniformitarian paradigm, the Northern Hemisphere glacial and stadial periods were times of extreme cold, on the order of 10 to 20°C (18–36ºF) colder than the present day climate. Logically, the extreme cold should have caused mass death, but instead the new evidence points to extinction happening when the climate warmed. It is good to remember the warmer temperatures in the mid and high latitudes would not have been overly warm for the animals since the ice sheets were still melting. Ice sheets would cause cold pools of air to form since sunlight is reflected off of the ice. So to say the animals died from excessive heat, which would not have been warmer than today, is unreasonable. THE POST-FLOOD ICE AGE WAS VERY DYNAMIC. Figure 2. 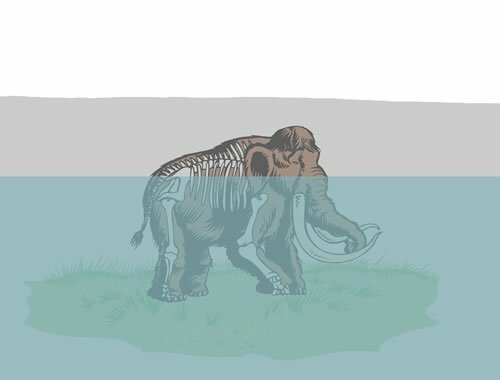 Summary schematic of how the post-Flood rapid Ice Age can account for all the many mammoth mysteries (drawn by Dan Lietha). Some carcasses, of which there is a very small number compared to the skeletons, remained frozen with partially decayed stomach contents. The reduced state of decay is mostly because elephant digestion takes place after the stomach.18 The remains must be frozen moderately fast, but a snap freeze in not required. Some carcasses show broken limb bones from either trying to extricate themselves from the dust packing around them or by permafrost faulting. 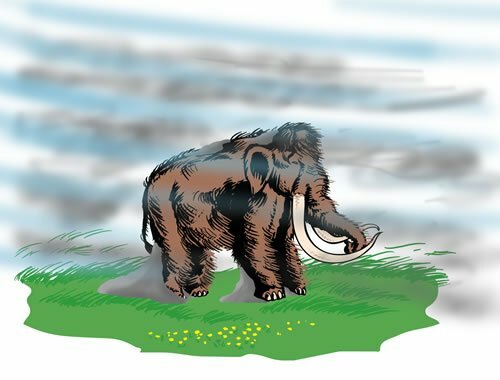 The woolly mammoth, which lived across the mid and high latitudes of the Northern Hemisphere, is one of dozens of animals that went extinct at the end of the Ice Age. Uniformitarian scientists have been unable to explain this mass extinction. Whereas animals were believed to have died during cold periods, a new theory suggests instead they died during warm periods. However, this theory is unreasonable because it is normally cold that stresses animals. With the existence of ice sheets, these “warm periods” would have been cooler than or at best similar to today and less stressful than very cold winters. 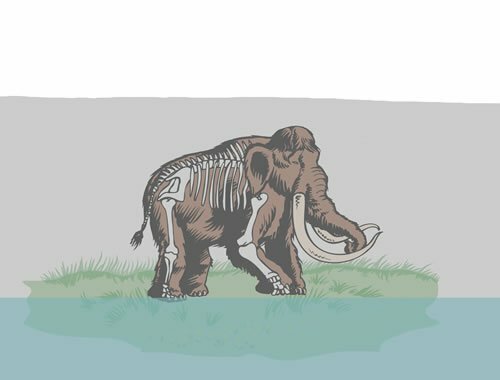 The post-Flood rapid Ice Age can explain the huge number of Ice Age animals because winters were mild and summers cool early in the Ice Age. 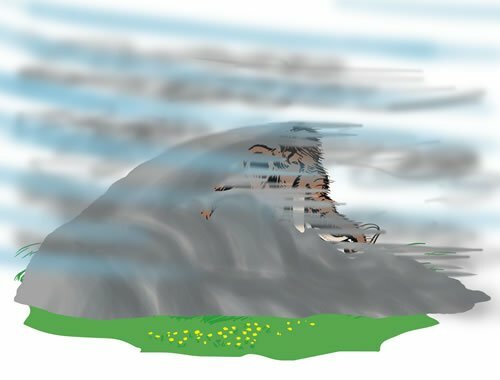 The mass extinction occurred because, near the end of the Ice Age, winters became much colder and drier than today, causing strong, windy dust storms. 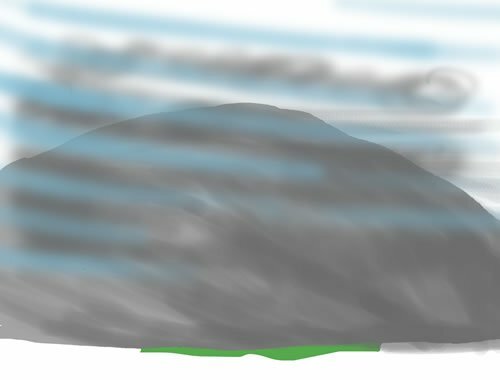 It is these powerful dust storms that can explain the extinctions and the data from Siberia. 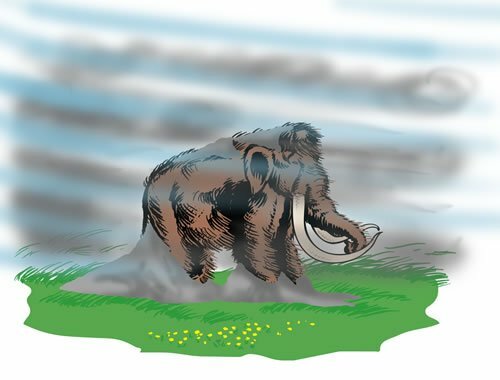 Figure 2 summarizes how dust storms and faulting permafrost can account for all the many mysteries of the extinction of the woolly mammoths, especially in Siberia. M.J. Oard, Frozen in Time: Woolly Mammoths, the Ice Age, and the Biblical Key to Their Secrets (Green Forest, AR: Master Books, 2004). V.E. Repin, O.S. Taranov, E.I. Ryabchikova, A.N. Tikhonov, and V.G. Pubachev, “Sebaceous Glands of the Woolly Mammoth, Mammothus primigenius Blum. : Histological Evidence,” Doklady Biological Sciences 398 (2004): 382–384; S.R. Tridico, P. Rigby, K.P. Kirkbride, J. Haile, and M. Bunce, “Megafaunal Split Ends: Microscopical Characterization of Hair Structure and Function in Extinct Woolly Mammoth and Woolly Rhino,” Quaternary Science Reviews 83 (2014): 68–75; Oard, “Woolly Mammoths Were Cold Adapted,”Journal of Creation 28, no. 3 (2014): 15–17. J.M. Stewart, “Frozen Mammoths from Siberia Bring Ice Ages to Vivid Life,” Smithsonian 8 (1977):60–69; Oard, Frozen in Time. A. Cooper et al., “Abrupt Warming Events Drove Late Pleistocene Holarctic Megafaunal Turnover,” Science349 (August 7, 2015): 602–606. M. Walker and J. Lowe, “Quaternary Science 2007: A 50-Year Retrospective,” Journal of the Geological Society, London 164 (2007): 1073–1092. C. Hammer et al., Preface to special edition on ice cores, Journal of Geophysical Research 102 (C12) (1997): 26,315–26,316. Oard, The Frozen Record: Examining the Ice Core History of the Greenland and Antarctic Ice Sheets (Dallas, TX: Institute for Creation Research, 2005). 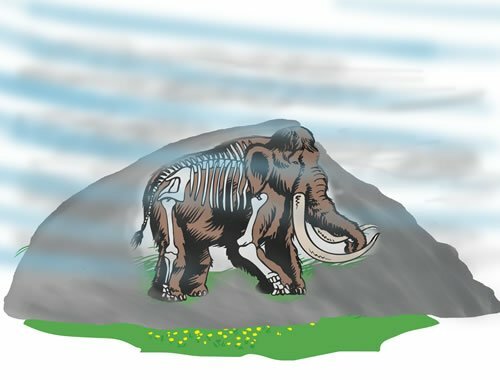 Abby Ohlheiser, “Abrupt Climate Change May Have Doomed Mammoths and Other Megafauna, Scientists Report,” The Washington Post, July 23, 2015, http://www.washingtonpost.com/news/energy-environment/wp/2015/07/23/humans-may-be-off-the-hook-for-mammoth-extinctions-say-scientists/. Global Warming: A Scientific and Biblical Exposé of Climate Change (DVD; Coral Ridge Ministries and Answers in Genesis, 2008); Oard, “Is Man the Cause of Global Warming?,” The New Answers Book 3 (Green Forest, AR: Master Books, 2009), 69–79; Oard, “Global Warming: Examining the Issue Carefully,” Answers, April–June 2006, 24–26. Oard, Frozen in Time; Oard, The Great Ice Age: Evidence from the Flood for Its Quick Formation and Melting(DVD; Canby, OR: Awesome Science Media, 2013); Oard, “Where Does the Ice Age Fit In?,” The New Answers Book 1 (Green Forest, AR: Master Books, 2007), 207–219; Oard, “Setting the Stage for an Ice Age,” Answers April–June 2007, 59–61. L. Vardiman and W. Brewer, “A Well-Watered Land: Numerical Simulations of a Hypercyclone in the Middle East,” Answers Research Journal 4 (2011): 55–74, https://answersingenesis.org/the-flood/numerical-simulations-of-a-hypercyclone-in-the-middle-east/. R.W. 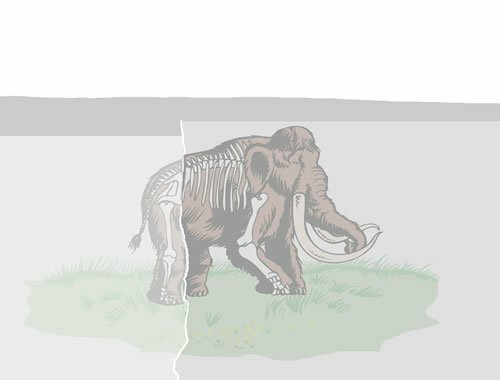 Graham and E.L. Lundelis Jr., “Coevolutionary Disequilibrium and Pleistocene Extinctions,” in P.S. Martin and R.G. Klein, eds., Quaternary Extinctions: A Prehistoric Revolution (Tucson, AZ: University of Arizona Press, 1984), 223–249; Oard, “The Puzzle of Disharmonious Associations During the Ice Age,”Journal of Creation 26, no. 3 (2012): 15–17. Oard, The Missoula Flood Controversy and the Genesis Flood (Chino Valley, AZ: Creation Research Society Books, 2004); Oard, The Great Missoula Flood: Modern Day Evidence for the World Wide Flood (DVD; Canby, OR: Awesome Science Media, 2014); D. Alt, Glacial Lake Missoula and Its Humungous Floods (Missoula, MT: Mountain Press, 2001). Hu et al., “Mississippi River Water in the Florida Straits and in the Gulf Stream off Georgia in Summer 2004,” Geophysical Research Letters 32 (2005). Oard, “Evidence Some Woolly Mammoths Asphyxiated from Dust,” Journal of Creation 29, no. 3 (2015): 3–5 (forthcoming).